John Loughran urged his mother to give him more time to put his boots on. It was after 11 o’clock at night. He had been in bed and stood in the hallway before her in a white vest, trousers and boots that needed to be tied. There was shooting, and the sound of voices of people injured and dying, calling for help, could be heard in the street. Minnie Loughran had called to her 34-year-old son’s house to ask him to help the wounded and dying. Her son was a father of three children and another on the way. John Loughran left his mother’s side and the next time she saw him, a few minutes later, she was cradling him in her arms and begging him to speak to her as his life ebbed quickly from his body. Minnie Loughran regularly spoke about that horror-filled night until she passed away a few years ago and often spoke of her regret for asking John to go out. John Loughran was one of six men shot dead on the night of Saturday Feb 3/Sunday February 4 1973 in what became known as the New Lodge Six Massacre. He died a hero. Mrs Loughran’s heartbreaking account was given to a community-based inquiry into the massacre on the 30th anniversary. Last weekend the people of the New Lodge gathered to remember that awful night on the 40th anniversary of the massacre. To a person on their lips was the call made the day after the British army and loyalist shooting spree - a call for the truth about why six innocent men were gunned down yards from their own homes in streets they grew up in from boys to youths and men. 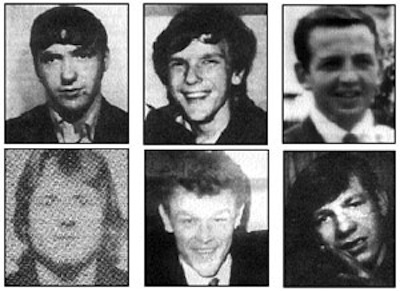 In these peaceful times the families, supported by Relatives for Justice, also want to know why the British government continues to deny them a public inquiry into the killings; why a cover-up for 40 years; why no apology has been given for the murderous behaviour of their troops; why it has not refuted the claims publicly made at the time by British forces that they were engaged in a “gun battle” with the IRA and that they had shot six ‘gunmen’ and wounded another. They also want answered the precise relationship between the British army and the gunmen in the car who shot dead two men outside Lynch’s bar and which became the immediate prelude to the other four killings. The car came from the loyalist Tiger’s Bay area and it was left outside Tennant Street RUC barracks, off the Shankill Road, a short distance away. Were the killers members of the Military Reconnaissance Force, a British army unit? Those who were shot dead were highly respected - Jim McCann was 19, the youngest of eight children. He died beside his friend Jim Sloan, also 19, who was five weeks married and died not knowing that his wife was carrying his son. Tony ‘TC’ Campbell was shot dead on the night of his 19th birthday on his way home from celebrating. Brendan Maguire was a hero like John Loughran. He gave his life trying to rescue Tony Campbell from a withering fusillade of gunfire. Ambrose Hardy came from a family of 12. He died beside the other three at the corner of Edlingham Street. In his hands he waved a white piece of cloth to protect himself from danger. Charlie Carson was severely wounded but miraculously survived. Survived, as has the community of the New Lodge Road who are as determined today as they were 40 years ago to get the truth. And this determination was symbolic, reflected in the unveiling of a plaque by the grandson of Jim Sloan. The search for truth is now in the hands of a new generation.